The United States military is calling for ideas to aid a joint study with NASA that will identify the requirements necessary to make interstellar space travel possible, as well as practical. The military's Defense Advanced Research Projects Agency (DARPA) put out the request for information, or RFI, to help support a detailed study of the 100-Year Starship project, which it's working on with NASA. DARPA isn't asking for spaceship designs at this early stage; it just wants some help organizing the project and making it more feasible, especially from a financial standpoint. 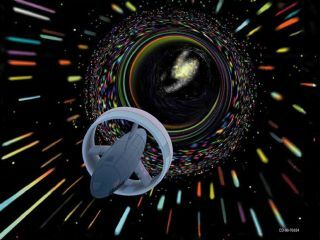 The 100-Year Starship project aims to enable a manned journey between the stars sometime in the next century or so. Such "Star Trek"-esque travel would require a variety of technological breakthroughs, particularly in propulsion systems. The most far-flung spacecraft, NASA's unmanned Voyager 1 probe, has traveled about 11 billion miles (17 billion kilometers) from Earth since its 1977 launch. For comparison, the nearest star beyond the sun is about 25 trillion miles (40 trillion km) away. The 100-Year Starship project seeks to meet such challenges over the long haul, though at this early stage the pressing questions are organizational rather than technological. The effort gathered momentum with a strategic planning workshop in January and has now moved into the study phase. "The 100-Year Starship Study is a project seeded by DARPA to develop a viable and sustainable model for persistent, long-term, private-sector investment into the myriad of disciplines needed to make long-distance space travel practicable and feasible," the DARPA request reads. The two organizations want suggestions for how best to structure, manage and fund a project that must last at least 100 years. And that's where last week's request comes in. "The respondent must focus on flexible yet robust mechanisms by which an endowment can be created and sustained, wholly devoid of government subsidy or control, and by which worthwhile undertakings — in the sciences, engineering, humanities, or the arts — may be awarded in pursuit of the vision of interstellar flight," DARPA officials explained. DARPA's deadline for suggestions is June 3. The agency said it does not anticipate awarding a contract based on the information it receives this time around.